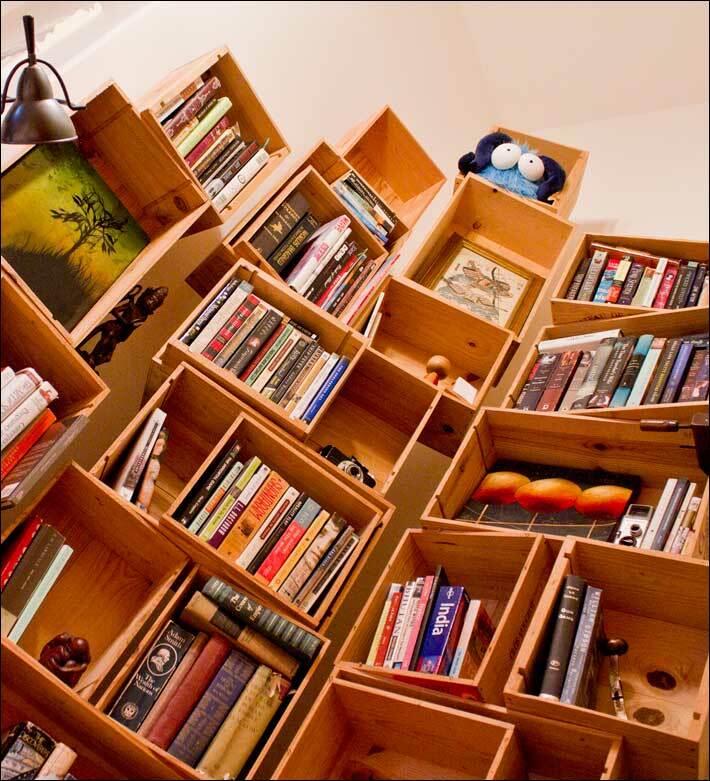 The Wine Crate Bookshelf in my bedroom. As a design element, wine crates are whimsical,functional, and highly versatile. They offer the warmth of wood and lend a wonderful found object quality to any project. Preparing the crates. These days most wine ships in cardboard so finding crates is tricky but when you can they are almost always free. Clean them up by sanding off sticker labels and anything that’s been written in marker. Remove the staples that secured the lid (most likely destroyed when it was pried open) and sand smooth any splintered areas. If you like, you can stain the wood at this point t0 add variety and visual contrast to a multi-box project. Arrange the crates somewhat haphazardly, with angles askew. Alternate between small and large, vertical and horizontal. Nest smaller boxes inside larger ones to create density. Plan for art spaces that will break up visual monotony and create negative space. Assembly. 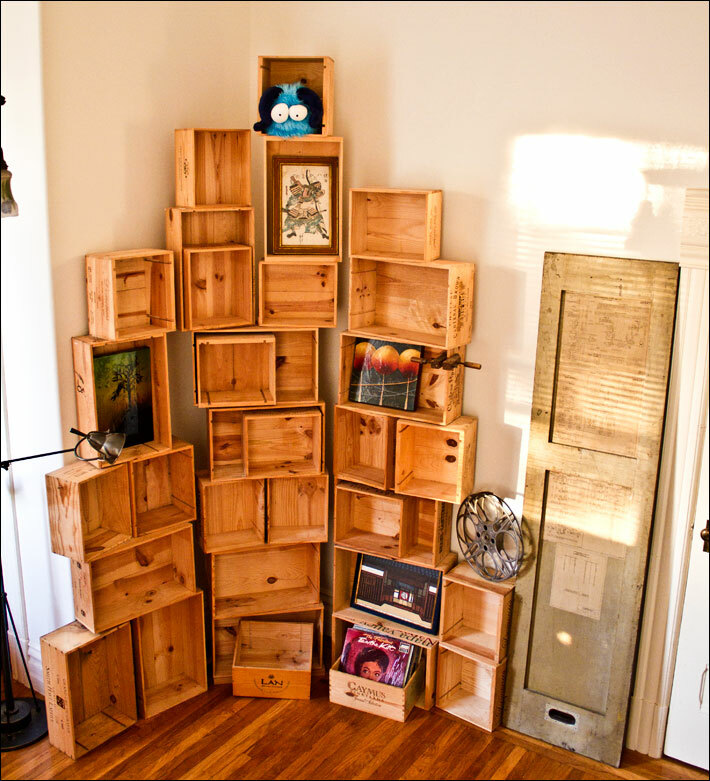 Once you have an arrangement of shelves that looks good, secure the crates to each other starting from the top. Clamping several creates together will let you remove them from the stack and permanently secure them with screws. Pro-tip: make the screws invisible by screwing down from the top where the boxes are above eye level and up from the bottom where the boxes are below eye level. Leave the nested boxes loose. The shelves recede slightly backward as they rise and there’s an invisible post fixed behind them as a wall brace about halfway up; nothing fancy. There are some wedges to close the gap between shelves that don’t quite line up in the stack. 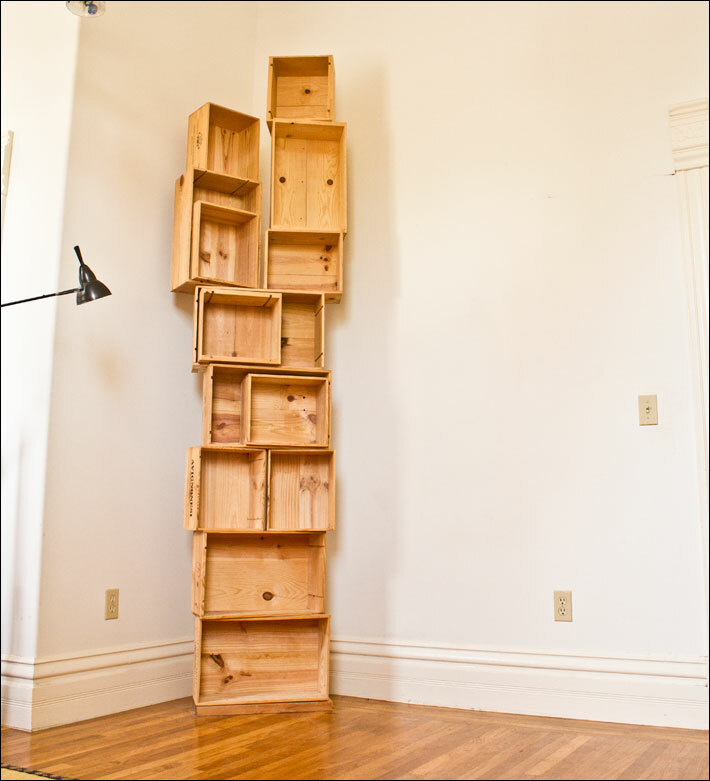 In my old apartment, a previous version of this shelf bowed outwards so I put one section on a platform with casters allowing it to roll away, freeing the space behind for tall storage and making it literally a bookshelf with a secret (if shallow) passageway. Making it look good. Place your artwork first and then the books. The floor shelves are ideal for oversized volumes, coffeetable art books, and vinyl records. Less is more—Ikea’s minimalist cubic Expedit bookshelf looks so much better in the showroom than in your flat because the show model has five books, a picture frame, and a vase while yours is crammed with every book you’ve ever read. The haphazard, organic arrangement of crates accommodates some clutter but offsetting books with found objects and curiosities creates charm.